The very best low-carb recipes are the very best recipes, period. This is one of those. Add a Garlic Aioli for dipping if you like, but even without a sauce they have a wonderfully spicy taste. By far the easiest way to make them is to start with prepared artichoke hearts from a jar. *See notes. These bloom out in the hot oil like a fan of crispy little chips. Serve them as a side dish in place of french fries or with a dip as a snack or appetizer. Wash and cut off the stems from fresh baby artichokes. Cut off and discard the top third of each artichoke. Peel away the green outer leaves until only a yellow-colored cone remains. Trim the remaining leaves with kitchen shears to remove any tough tips or thorns. Drop the fresh artichokes in a bowl of water with 2 tablespoons of lemon juice to prevent browning. Trim away any tough outer leaves or leaf tips. Slice the fresh or prepared artichoke hearts vertically into eight narrow wedges. The jarred ones may be available quartered so you only need one additional cut per piece. You want narrow wedges with the leaves intact so they will fan out when they fry. Drain and gently blot them between paper towels to get out as much of the liquid as you can, so they won’t splatter. Prepared artichokes will be soggier than fresh, so let them air dry for several hours if possible. Heat the oil to 360º F and fry the artichokes in several batches until brown and crisp. Drain on paper towels, sprinkle with salt, and serve hot. 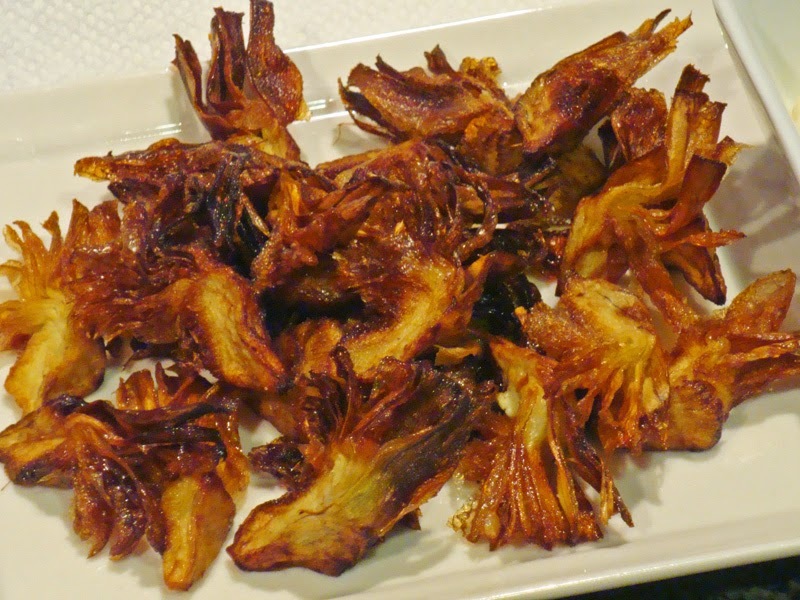 * Estimated fat content of drained, fried artichokes. *My local Costco store sells large jars of Kirkland artichoke hearts packed in brine. They are bigger than the ones in cans and they are not pre-sliced, but they are perfect for this recipe. You have to buy two jars, but once you’ve tried them, you will be glad you have a lot of them! Each jar should make enough for 4 to 6 servings. I let them air-dry, uncovered, in the refrigerator overnight before frying them. Baby artichokes do not have a fuzzy choke that needs to be removed. If using Kirkland jarred hearts, any fibers in the choke will be crisp and edible so they don’t have to be removed either. Artichokes are the flower buds of a thistle. Different sized artichokes come from different parts of the plant. Large ones, weighing about 10 ounces, come from the top. Medium-sized ones, about 7 ounces, come from the side of the plant and ripen a week or so later. The baby ones, which sprout where the leaf meets the stalk, are the last to be harvested. Recipe adapted from Carb Wars; Sugar is the New Fat. Artichoke Fries, Starchy Side Substitute. Bookmark. Simple is best, but can this scrumptious-looking item be THAT simple? Thank you, CarbWars rules! Anonymous, I agree, simple is best! And, yes, this one really is that simple. ditamac, I wasn't sure how to figure the servings. How did you come to 11? Each artichoke heart is cut into 8 pieces, so if you start with 12 artichokes and divide them into 3 servings, you get 32 pieces each. That sounds like a lot; if any of you make them, let me know what you consider "one serving," and I'll change it. These look SO good. But I'm confused…what makes them reddish orange if no seasoning is added? You mentioned it's spicy, so I'm wondering if there's some sort of hot sauce you marinate them in first. Maybe you used hot chili oil? Melanie, no, they just get nice and golden brown. It must be the lighting that makes them look red. A chili sauce might be good with them though! If you start with canned quartered ‘chokes, keep an eye on the size. I sliced them in half but the pieces turned out to be mostly too small and a good bit of them fell apart and/or burned. I think I will try again with full quarters in a good two inches of oil next time. Thanks for the tip, JD. I have noticed there is often a size difference from brand to brand. 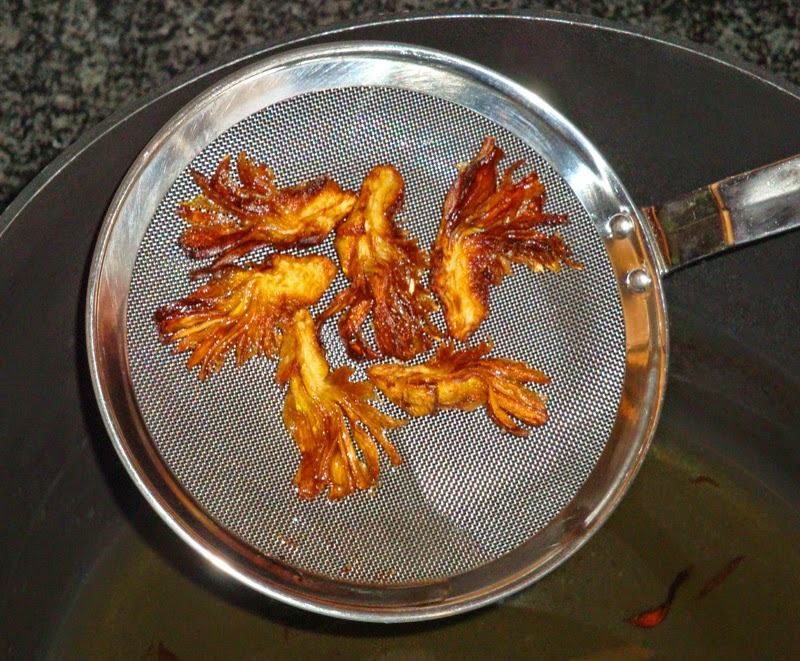 It might be a good idea to test fry one or two before slicing them all.